The easiest ways to order are here! Domino’s Pizza (NYSE: DPZ), the recognized world leader in pizza delivery and digital ordering technology, is leading the way once again with its latest breakthrough ordering option, which combines two new-to-the-world innovations – ordering via tweet and ordering via emoji, specifically the pizza emoji. The ordering platforms are launching throughout the U.S. today. Domino’s is the first brand to use an emoji on Twitter to place and complete an order. Customers who add their Twitter handle to their Domino’s Pizza Profile will be able to re-order their Easy Order by simply tweeting #EasyOrder or the pizza emoji to @Dominos. Domino’s will then send their Easy Order through an automated direct message, which customers must confirm. Customers who do not have a saved Easy Order will be prompted to set it up in their Pizza Profile. 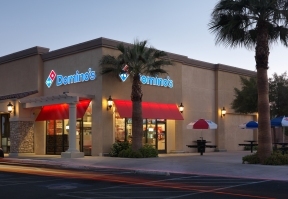 To learn more about Domino’s AnyWare technology, including how to enable ordering via Twitter, visit anyware.dominos.com.